For the past couple weeks since the Equinox to Equinox Rally started I’ve been peppering my regular rides with picking up points. As I mentioned in the post Photo Rally Bonus Hunting – Links, Books, Google Maps, I’ve got maps full of places and points of interest to ride to. But sometimes… sometimes you just don’t feel like “working.” So, I’ve been taking it easy and making an effort to stop and see some of the places I’ve been visiting and not just doing drive-by point collecting. 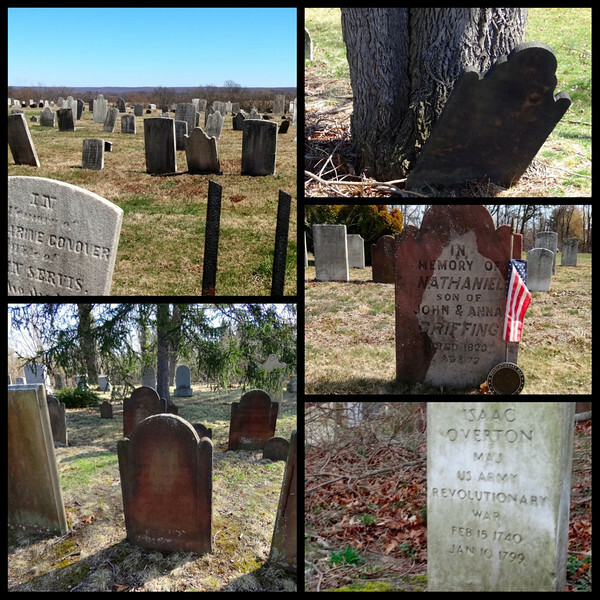 Lately the thing that has been capturing my attention is – old cemeteries. I don’t know what it is about about certain places or things that makes you have an affinity for them. Is it the place itself? Is it what is represents? Is it strictly the visual experience? Maybe it is all of those things? 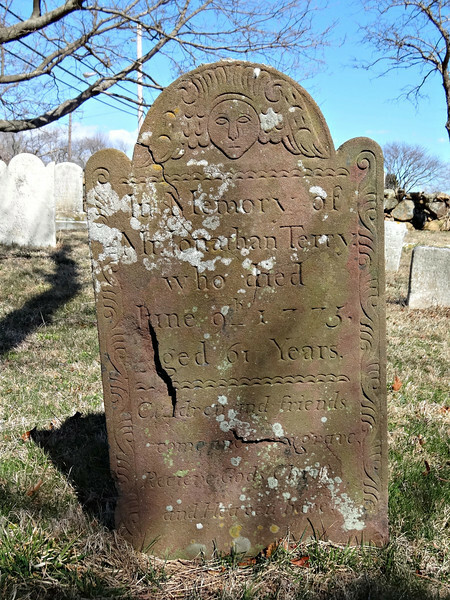 The information carved on old grave stones can be surprisingly deep – the cause of death, age in years months and sometimes days. I read one stone that said the young boy buried was killed by a wagon wheel. Way to embarrass the kid for eternity. 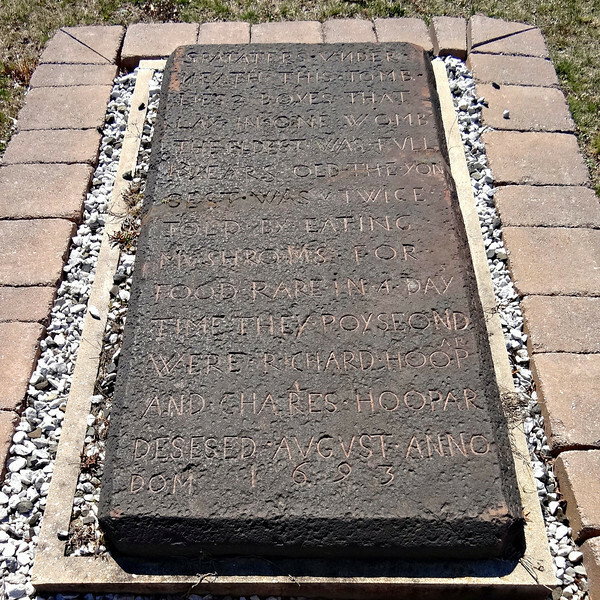 This stone from Piscatawaytown Burial Ground in NJ was pretty descriptive – mushrooms! Apparently the type of stone, the decorative imagery and lettering itself give clues to who the local carver was. I’ve just put my toe in the next to water researching information about stones on Long Island. It’s fascinating. So what is it that makes me keep looking at these old burial grounds? I wish I knew. I don’t find them morbid or anything. On the contrary the spaces are often peaceful and a place of quiet reflection. These people were here. They walked the Earth, they mattered to someone. 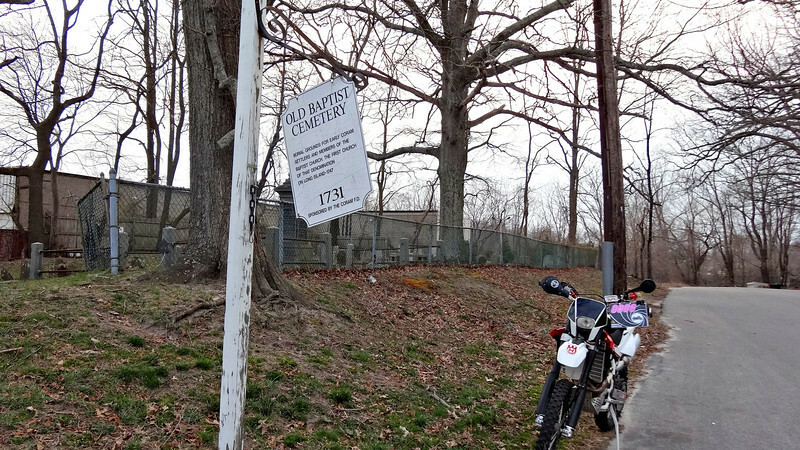 During the week I rode to a burial ground in the town of Coram. It was a little less cared for than I would have hoped. Many broken stones, some trash, lots of leaves and bits of tree branches laying throughout it. The sign at the entry way is hanging on by a thread and a prayer. I parked and walked up the small hill in to the grounds and wound up meeting a gentleman who was also there looking through the stones. 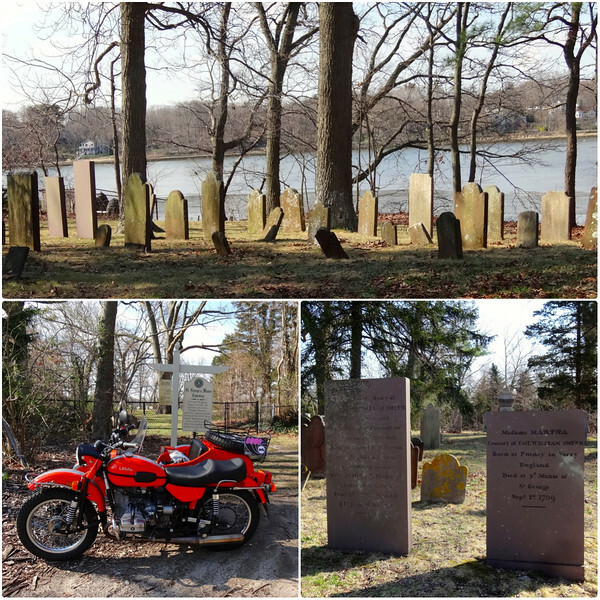 We struck up a nice conversation and talked about other old burial grounds on Long Island. He was a very nice fellow. So, my single friends – if you don’t know where to go to meet a nice man or woman? Cemetery. Old cemeteries are amazing repositories of interesting history. I’ll often stop and take a wander through looking for just such gems as the mushroom story. They really are – in this area, lots of Revolutionary war soldiers, spies – makes for interesting visits. Great pictures. I especially love the one with all the crooked tombstones. Very eerie in a way. Sometimes, the best part of the ride is getting off the bike and exploring the place you have come to. It is also about the people you meet. I just hope that man you met in the cemetery wasn’t a ghost! Maybe he WAS a ghost. Come to think of it, I never did see him get in a car and drive away! I don’t know but just maybe some of those we find in old cemeteries, were friends in a previous life. I know I find cemeteries very peaceful and friendly. People buriedd there aren’t judgemental and just seem to be happy some mortal stopped by to say hello. I find the old cemeteries hauntingly sad/beautiful, but at the same time the old headstones can be a real work of art. I agree with the above comments. They are not some weird scary place but rather a peaceful oasis. Most people don’t realize it but the first cemeteries were also set up as parks. We Are the Hopeless Gang!